Chapter 3: Cadet in the SATS General Botha: second year. Chapter 7: First Post: Hottentots Holland High School. Chapter 8: Meeting my match! Chapter 9: My first mission station. Chapter 11: The Navy - at last! Chapter 17: More Stupid Interference! Chapter 22: What a scandal! Chapter 25: England at last! Murray’s transfer from Blythswood Institution (see Chapter 20: Transfer), where he was the Superintendant, to being the Principal of a Junior Secondary School (i.e. a school that had classes up to what was then called Standard 8, now called Grade 10) was a great shock to him. He had devoted his life to Blythswood and worked incredibly hard for the all the schools in the Institution. 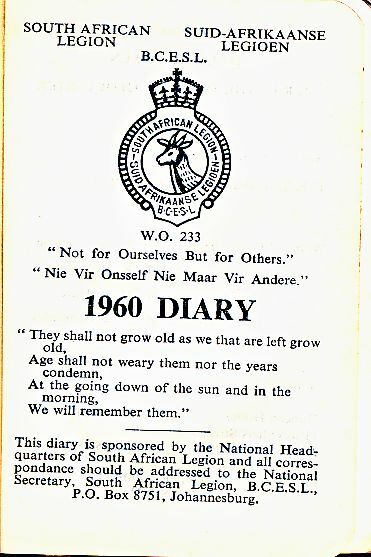 He kept a diary of the period in a diary of the South African Legion of the British Commonwealth Ex-Servicemens’ League (BCESL), of which he was a member at the time. The next day there was a farewell from the people of Nqamakwe at the tennis courts in the village. The next day there was a “presentation by students at Assembly in the morning” and then “Farewell by white staff at afternoon tea in De Wet’s house.” The double irony of that was that was that firstly “De Wet’s house” was the first house Murray and Margery had lived in when they moved to Blythswood and secondly that De Wet was the very one whose complaint about the non-segregation of the High School staff room had led to Murray’s demotion. I wonder how they managed not to choke on the tea? Perhaps the saddest entry in the diary is for me the one for Thursday 24 March: “Last Assembly in Blythswood. 1st Quarter ends.” That’s all. And so much effort, so many hopes end right there! On the next day, Friday, Murray and Margery started their packing and then attended another Farewell Party in the Nqamakwe Hotel for all their friends from the village, as well as for the BESL. Packing continued the next day and the Grundlings arrived from Buntingville with the pantechnicon with all their stuff. Murray and Margery spent the night at the Nqamakwe Hotel. It must have been hard for them not to be able to sleep in the house they had called home for so long. The following day, Sunday 27 March, was spent finishing the packing and then “Visited Blythswood friends to say ‘Goodbye’. Do., in village. Lunch at Botha’s (Mr Botha was the magistrate in Nqamakwe). Handed over to Grundling. 2.10 p.m. left for Cape Town. 8 p.m. arrived Humansdorp. They left for Mthatha on Friday 1 April and had car trouble along the way. They arrived at Buntingville at 2.30 p.m. on 2 April and immediately started unpacking. On the following afternoon their friends Seton and Margaret Jacques arrived (Seton was at the time Principal of Shawbury High School near Mqanduli, not far from Mthatha) for afternoon tea and then took them to dinner in Mthatha. I was at school in Bloemfontein and only arrived on my vacation after they were already settled into Buntingville. My father buried himself in his study with his ship pictures and books when he was not at school. Chapter 11: The Navy – at last!